Noon: I arrived Bali quite late, as common Indonesian flights is usually delay or something. That’s why that day, I just got the chance to visit Sukawati Market in Ubud Area, the place where you can buy many Bali Souvenirs with a very cheap price than in Kuta/Legian, if you can bargain it. The shirts, short pants and sandals/slippers price range is about RP. 15,000. The other stuffs, please bargain at least 50-75% from the given price. Nite: I had dinner in Jimbaran.. seafood. The clam dishes was so delicious.. too bad it’s not a buffet dinner, unless I could taste plenty of it. After getting back to hotel, I strolled down the Kuta Street and hang out in this Bali Club House café? The place was so great, I’d like to tell you about it more but it is not there anymore when I checked the other day. Afterward, I hang out with some colleagues at Food Court in front of Kuta Beach. The food here is kinda expensive comparing to its taste. I think we can get a better fast food for Rp. 40,000. Morning: I went for Rafting in Ubud Area. I forgot the name of this rafting place but I really enjoyed it. although beforehand, I strongly suggest you to prepare yourself to go down/climb up through a thousand footsteps I think.. It was so many that made my leg hurt so bad.. plus I almost drown during the rafting too, cause I felt out of the raft, went under it and I am so thankful to God that I could manage myself out from under the raft.. Be careful if you’d like to try rafting!! Nite: I enjoyed music and dancing in Hard Rock café then hang out again at this Food Court in front of Kuta Beach. Visiting many places this day. Went to Ubud to taste this delicious-so-heard Ibu Oka Babi Guling. The mixed lunch set is about Rp. 30,000 and it does taste really good. I’d love to go there again and try it. 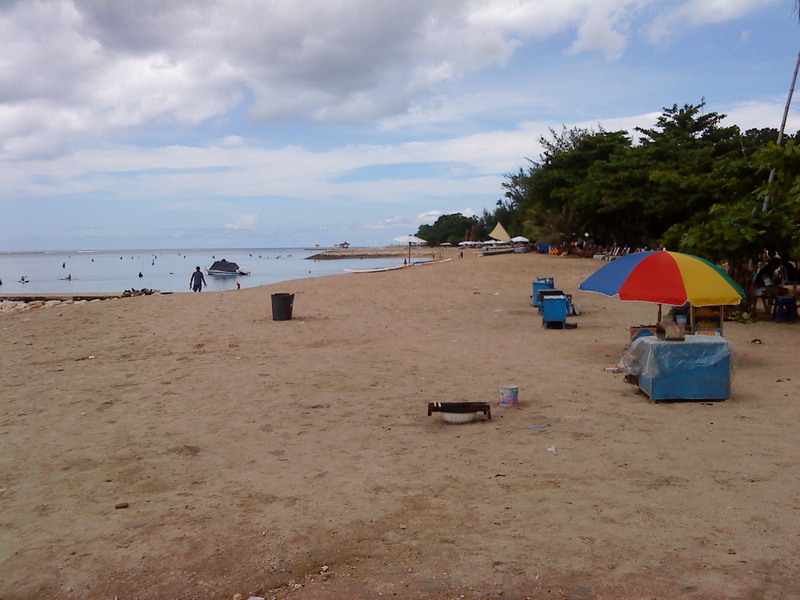 Sanur Beach, it was my first time there. I like the beach but I am very surprise, the same surprise that I got when I see Kuta beach.. it was so dirty, full of garbage.. So sad seeing it because 9 years ago, Kuta was very beautiful beach. 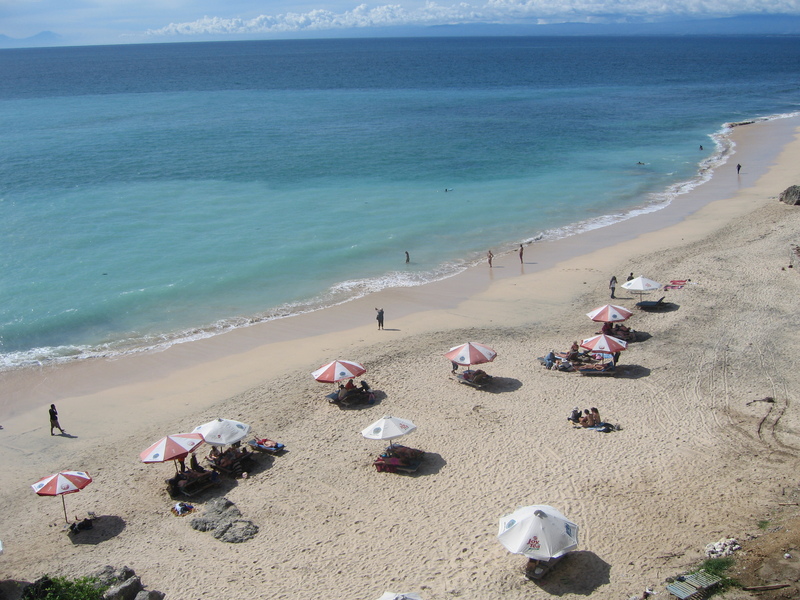 Dreamland Beach, I see this beach from the top of the cliff only where there is this KLAPA café. The beach looks very clean from above and good shore, I really wanted to go down there but the pain in my leg from rafting was killing me. Anyway, the café was so good, it has pool and looked new. The price of drinks there is same as Jakarta club, which is quite expensive for a café in Bali. KU DE TA café in Seminyak. I like this café. You can enjoy the sunset here, many cute foreigners :p and the food is not bad. Like the cheese pizza. The price is affordable, same as Jakarta’s Café. At nite, strolling down the clubs in Legian Street. Really wanted to come inside the club but too bad I haven’t had the guts to come in :p Well, none of my colleague likes to hangout so maybe next time. As for hotel, I stayed at Hard Rock Hotel which is very great place but too bad, I was too busy doing activities outside. I also stayed at this Yulia Beach Inn hotel which I regretted to choose this hotel. Why? Because they gave me a very awful room with a broken bathtub, a clear shelling glass in the bathroom where people can see you shower from outside and a very expensive price of Rp. 400,000 a nite. Honestly, you can get a better room in poppies with this price. My fault, I should have check out the room or be patient enough to go to poppies and find a good place to stay. So my advice to you: Please check out your room before deciding to stay in the hotel!